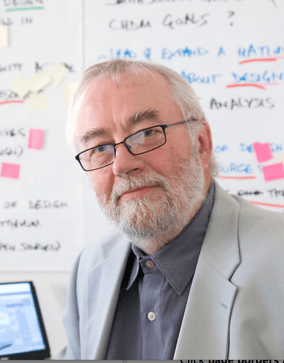 Another technology pioneer has died as Bill Moggridge lost his battle with cancer on September 8 at age 69. Moggridge is largely credited with building the world’s first laptop computer way back in 1979. The Grid Compass 1100 was launched three years later in April 1982 with a price tag starting out around $8,000 – a serious amount of money at the time. A curator at the Computer History Museum said Grid Systems Corp. won the patent for the clamshell design we are familiar with today. From there, Moggridge was directly responsible for coming up with the foldable screen form factor. Up until that point, portable computers were anything but – often weighing more than 20 pounds and resembling a portable sewing machine. The 11-pound clamshell laptop was powered by Intel’s 8086 processor, 340-kilobytes of magnetic bubble memory, a 1,200 bits/s modem and ran its own operating system called GRiD-OS. External devices like floppy and hard drives could be connected via an I/O device bus. Unsurprisingly, the device had a limited pool of buyers with the primary customer being the US government. The Grid was used in a number of environments ranging from space shuttle missions to paratroopers dropping into combat. Moggridge later went on to co-found design company IDEO in 1991 and took over as director of the Cooper-Hewitt National Design Museum, a wing of the Smithsonian Institute, in January 2010. He held this position until his death this past weekend.